It’s usually rain that interrupts cricket matches, but the most northerly doodlebug of World War II was the one that fell on Tudhoe Cricket Club at 6.05am on Christmas Eve: 24th December 1944. It would seem that the doodlebug blew up in mid-air – somewhere just above roof level – and the biggest piece to survive was the nose portion, which fell to earth on Tudhoe Cricket Club. It has been wrongly suggested at one time or another that it might have landed on the pavilion, but we now understand that was not the case. The old wooden pavilion was in the opposite corner of the ground to where the new clubhouse stands, and the new clubhouse is very close to the spot where the doodlebug actually came to earth. Cecil Lowes remembers the night the doodlebug fell: At the time, he was six years old, and his family home was at 254 Back Row, Tudhoe Colliery. (There was also Middle Row and Front Street, although only Front Street remains standing). At the rear of Back Row there was an ammunition hut. Cecil recalls: “When the sirens sounded everybody was advised to go under the stairs, which was always accepted to be the safest place. My mam got us safely under the stairs and then you had to black out, so she went to draw the curtains, and as she did the window blew and the glass came in, then the front door blew open and she suddenly remembered our Trevor. He was only about one year old and had been left in one of our two bedrooms. She went upstairs to find the ceiling had come down on top of the bed, and Trevor was laid underneath it, blackened by soot, but otherwise unharmed. Although the Germans’ most northerly doodlebug did terrible damage to hundreds of houses locally, blowing out windows and doors, blowing off tiles and tearing down chimneys when it exploded, amid the debris in one household, the decorations on the Christmas tree survived, and in 2010, 66 years later, one still came out to be given pride of place on her tree. “I was a four-and-a-half year-old blonde girl living in Front Street, Tudhoe, and went to bed that night wearing a white winceyette nightdress”, recalls Sandra Chaytors, who now lives in nearby Bishop Auckland. “I woke up with glass from the window covering the bed. I looked in the long wardrobe mirror and all I could see was a little girl covered in soot. Downstairs in the sitting room, which was kept only for best, we had a large Christmas tree, right in front of the window. It was decorated with miniature crackers and delicate baubles. On top of the piano and along the mantelshelf were Christmas cards. When the flying bomb exploded, it blew all the windows and doors out, and all the Christmas cards down, yet the delicate baubles and miniature crackers still hung on the tree. 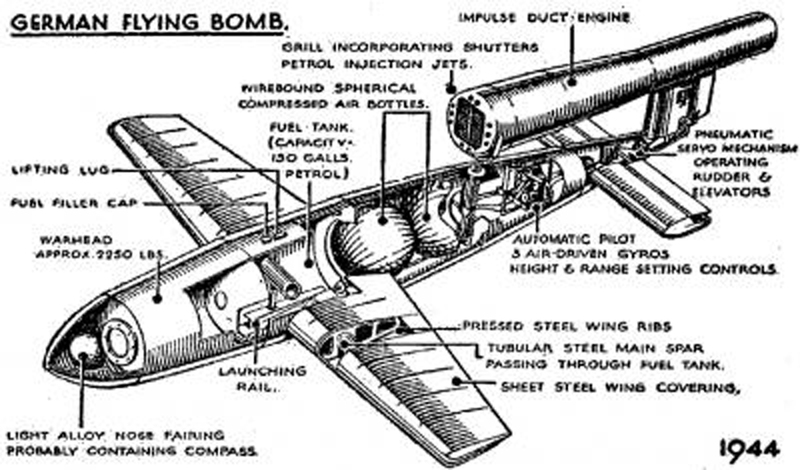 The Fieseler Fi 103 or V-1 flying bomb commonly known as a ‘Doodlebug’, was notoriously inaccurate when launched from Heinkel’s – which is how it came about that the most northerly landed on Tudhoe at 6.05am, as opposed to its intended target, which had been in the Greater Manchester area. Its ‘V’ designation came from the German word ‘Vergeltungswaffe’ which translates variously as ‘retaliation weapon’ or ‘vengeance weapon’. In either case the implication was clear: The V-1 rocket was intended by the Nazis to be a horrifying weapon, meant to instil fear and break the morale of their intended victims. For a short time, it seemed they might succeed, although it was very dangerous for the Heinkel pilot, as well as for those within range of the bombs. His plane was unstable, on account of the weight of the missile; It had great difficulty reaching a normal flying height, so was flown just above wave-top level, and because of this, some planes ditched in the sea. Also, since doodlebugs often fell off other Heinkel’s, pilots had to dodge them, which added to their personal danger, and when the doodlebug was launched, it was for all the world as though someone had turned a spotlight on the plane, which was ‘lit up’ – fully visible to any British fighter who cared to take a shot at him, as well as to anti-aircraft emplacements – for a full two minutes afterwards. About 40 of these ‘flying bombs’ were fired that Christmas Eve but only 30 made landfall, the rest tumbled into the sea. Brindle in Lancashire was the first to feel the wrath of the mighty Luftwaffe, at 5.28am; the last bomb landed in Hyde, Cheshire 57 minutes later. The last of its kind to terrorise Britain landed in a field close to a sewage farm at Datchworth near Hatfield, Hertfordshire at 9:00am on Thursday 29th of March 1945. There were no casualties.